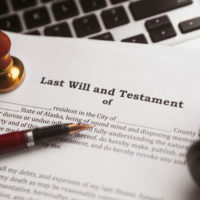 Who Inherits the Assets of a Person Who Dies Without a Will? Yes, you should write a will, even if you are young and healthy. When you have a will, your property is distributed according to your wishes, rather than the State of Florida applying the default options. If you have questions about what to write in your will or about how to collect assets that you have inherited, an estate and trust lawyer is the best person to contact. If a person dies without a will, the state does not automatically declare itself the owner of any property that belonged to the person when he or she died. Rather, Florida Statutes 732.102 and 732.103 stipulate the order of priority in which the decedent’s (deceased person’s) surviving family members inherit his or her estate. The order of succession of heirs for a decedent’s estate is somewhat complicated, because all families are different, but here are some examples of how the provisions of Florida Statutes 732.102 and 732.103 are applied. If the decedent was married at the time of death, his spouse usually inherits 100 percent of his assets. If George and Mary had four children together, but no children from any other relationships, Mary inherits George’s entire estate. If George and Mary have four surviving children, but Mary also has a son from her first marriage (George never adopted his stepson), then Mary receives half the estate and their four children receive the other half. If the decedent is unmarried at the time of death, but all children are living, the estate is divided equally among the children. If the decedent is unmarried at the time of death, but not all children are living, the deceased son or daughter’s portion of the estate passes to his or her descendants. For example, when Mary dies, her children Audrey, Bertrand, and Charles are alive, but her daughter Deirdre is deceased. Therefore, Deirdre’s children inherit Deirdre’s portion of the estate. If the decedent had no children and was not married, but his parents are still living, the parents inherit the entire estate. If the decedent did not marry or have children, and his parents are no longer living when he dies, the estate is divided equally among any siblings. In other words, the State of Florida is rarely entitled to the decedent’s assets. That can happen only when the decedent has no will and no family members. If the decedent made a will, he or she can leave their assets to whomever they choose, including friends or a charity. Mark R. Manceri practices estate and probate law in Pompano Beach, Broward County, Florida. Contact Mark R. Manceri to discuss your estate planning and inheritance questions.